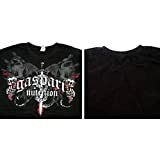 Gaspari Dragon Slayer T-Shirt Mens XL | Medical Supplies and Equipment. Extra 10% off orders over 0! I love the shirt! It fits very nicely. It is soft and fits around my muscles nicely.